Brooklyn Nine-Nine exhibits the daily life of the New York Police Department's 99th Precinct. The show follows the adventures of Detective Jake Peralta (Andy Samberg) and the squad as they must fight for justice and safety in their beloved city. The sitcom has seen immense success, clinching several award wins and being renewed for a sixth season on NBC. Despite being on for five years, it's not too late for you to catch up (just do a bit of binge-watching!). Here's five reason why you'd be missing out if you don't watch Brooklyn Nine-Nine! I mean, what would you expect from a cast pertaining of an SNL alumni, an ex-football player, and a writer from Parks and Recreation? Absolute insanity is what. The squad goes on crazy adventures that will leave you in utter hysterics; it's nearly impossible to contain yourself from giggling at their shenanigans! Fun Fact: B99 was created by the same people who pioneered classics such as The Office, Parks and Rec, and The Good Place! The main cast consists of two Latina and two black leads. That is practically unheard of in a mainstream comedy! Not only that, but Captain Raymond Holt (Andre Braugher) and Detective Rosa Diaz (Stephanie Beatriz) are both canonically members of the LGBTQ+ community! Holt holds the title of the NYPD's first black and openly gay Police Captain, an honor of which he is extremely proud of. As for Diaz, there is an entire episode pertaining to her struggles of coming out as bisexual to her family and coworkers. It gets emotional, y'all! 3) It deals with real life issues. While the show is mainly focused on making you laugh, it also manages to squeeze in some serious and important topics, too. Issues such as police brutality, gun control, sexism, and racial profiling are discussed with elegance and grace. It sheds light on current political situations by giving the viewer a solid understanding on the problems and how we, as a country, need to solve them. Brooklyn Nine-Nine breaks the barrier in so many ways, but with its cast being made up of entirely police officers, you would think women would just get pushed to the side. Not in the 99th precinct! The female detectives are just as intelligent (if not more intelligent) as the males. They are strong and have their own skill sets that make them useful, unique, and valuable members of the force. On the other hand, two of the male characters take on a more typical "feminine" personality. Detective Charles Boyle (Joe Lo Truglio) is a huge foodie and absolutely adores to cook. He even spends his free time running a food blog! And Sergeant Terry Jeffords (Terry Crews) is an absolutely massive body-builder type guy who takes pride in his wardrobe and loves to play fairy princesses with his daughters. Down with gender stereotypes!! The detectives of the 99th precinct have such an incredible dynamic. They all have such a great bond with one another and the friendships are so strong. You can't help but fall in love with the mini family that is created between them. They care about each other immensely and always have each others backs. 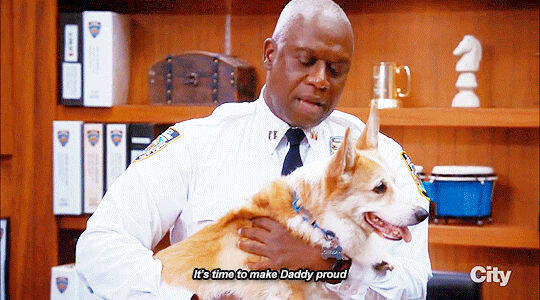 Captain Holt has a Corgi named Cheddar. Enough said.